Yakitori is a favourite late-night street food in Japan, where you'll find alleys lined with charcoal grills selling skewers by the hundreds. We're marinating our chicken yakitori simply, in a sweet soy sauce and serving them alongside some fragrant stir fried vegetables. Easy weeknight dinner to please the family! Share the moment #youplateit with us on Instagram. If using your BBQ turn it on now. Pat dry chicken with paper towel and dice into bite size pieces. Place chicken pieces in a bow with yakitori marinade and coat well. Set aside to marinate while preparing remaining ingredients. Wash the fresh produce. Soak the skewers in a shallow dish filled with water to prevent them from burning. De-seed capsicum and slice in 5 mm strips. Peel carrot, cut in half lengthwise and cut on a slight angle into 3mm slices. Trim spring onions and cut into 2-3 cm pieces. Trim ends off green beans. Peel and mince garlic and ginger. Thread the marinated chicken alternating with spring onion onto the skewers; coat with any remaining marinade. In a large non-stick pan (or BBQ), heat oil on medium-high until hot. Add the chicken skewers (working in batches if necessary) and cook 3 - 4 minutes per side, or until browned and cooked through. Transfer the chicken skewers to a plate. Heat olive oil in a pan (enough to cover base) over medium high heat. Add ginger, garlic and carrot and cook for 1 minute, until fragrant. Add capsicum , cooking for about 5 minutes, until carrot is tender. Add green beans and cook, stirring occasionally, a further 2 - 3 minutes, until beans are bright green and still have a little crunch. Sprinkle with sesame seeds and season with salt and pepper to taste. Remove pan from heat. 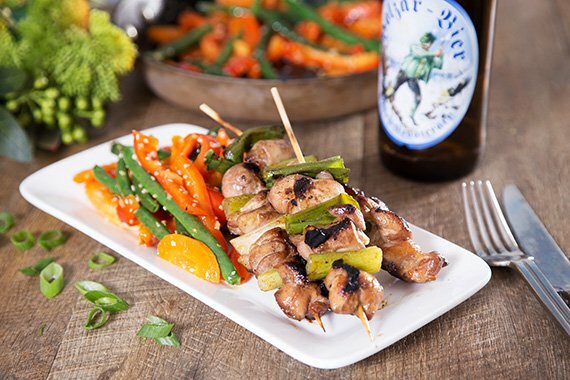 Serve chicken skewers alongside stir fried vegetables and enjoy!